Paul Revere’s Ride! The shot heard ‘round the world! Great American poets have influenced how we think about the start of the American Revolution. On Sunday May 18th we heard part of the real story. And we saw a lot of the places where, by the end of that first day of battle, over 4,000 colonials chased 700 British regulars back to Charlestown from Concord. We had a great turnout! With seventeen cars in the caravan, including friends from The Avanti Owners Association, Intl., we left the Webster’s house in Lexington about one o’clock. With our colonial forebears figuratively in the lead, we set off as a caravan of modern colonials including Gary & Jane Ash, Jaime Cardillo & Kim McKeown, Paul & Lynne Derosier, Paul Desautels, Bob & Elizabeth, Samantha and Garreth Gray, Dennis & Elaine Jolicoeur, Christian Jolicoeur, Arthur & Maria Masmanian, Charlie & Lorraine Peckham, Doug & Mickey Rodgers, Kathy & Jack Rodhouse, Paul & Pam Savard, Dan Takesian & Cathy Dreisel, Dave & Janet Thibeault, Tom Toomey & Peggy Clarke, Bill Waterhouse, Chet & Ann Webster. Our first stop was to walk the Old Burying Ground behind St. Brigid’s church and on to the National Historic Landmark, the Lexington Battle Green, where the first shots in anger were fired and where the first eight colonials were killed by British regulars on the morning of April 19, 1775. The British marched to Concord that warm April morning, on the road then called the Bay Road. We followed that same road and stopped next at the Minute Man National Historical Park Visitor’s Center. We watched a well-made 20 minute multi-media theater program called “The Road to Revolution”. The narrative followed the action along the Bay Road on that first day of The American Revolution. Our band of modern colonials proceeded along the same Bay Road, today called The Battle Road, but we did not have to walk. We were lucky enough to ride, mounted on our Studebakers (and Avantis)! Next, we motored out to Concord’s North Bridge to see where the colonials met and fought the British on a farmer’s bridge. We walked the replica of the bridge and posed for pictures before the statue of the Concord Minute Man (similar to the Minute Man statue on the Lexington Battle Green). Finally, we motored out of town on one of the prettier New England roads in the area passing well-manicured mansions and the occasional remaining farm. We cruised through five towns in all and drove through the center of Bedford just before four o’clock. Burgers, fish and chips and – okay – beer! at Waxy O’Connor’s Irish Pub in Lexington helped our Studebaker Colonials gear up for a final Revolution Quiz run by Ann Webster. The questions were hard! But winners were chosen and we all were winners in our very own Revolutionary ride. 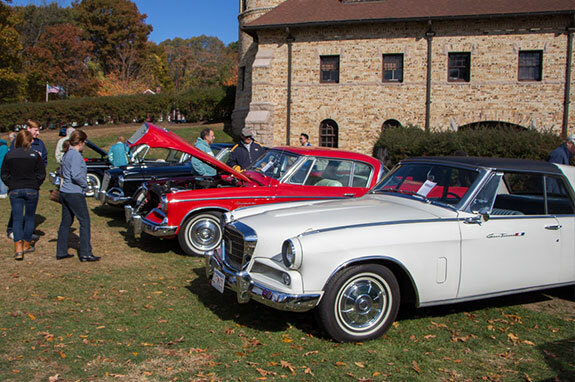 This year, we had pretty good weather for Ocean Bay’s Octoberfest on the lawn of the Larz Anderson Auto Museum in Brookline! A little cool if you were in the shade but not so bad if you were in the sun! A good group of Studebaker enthusiasts came from all parts of Studedom to make this another great Octoberfest. It is always great to see so many old friends drive in at this event each year. This was the 23rd consecutive year that Ocean Bay has been meeting on the lawn of the museum. Many club members, guests and their Studebakers have come to this event each year to make this a great end of the year celebration; but there is not a year that goes by that I don’t think of old friends and their Studebakers that once graced this lawn and they are just memories now. I find myself and a couple others like me the old men of the chapter now. 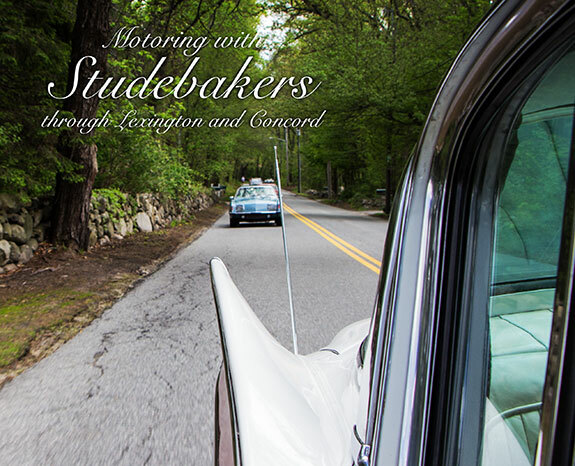 I do see more new faces and Studebakers lately, it is great to see this tradition continue each October. Such a success is a great testimony to how great Studebaker camaraderie really is! Again this year we had the Packard Club join us, this year we only had 3 or 4 postwar Packards show up and no prewar models. I would like to see that change next year so please pass the word to any and all your Packard buddies. 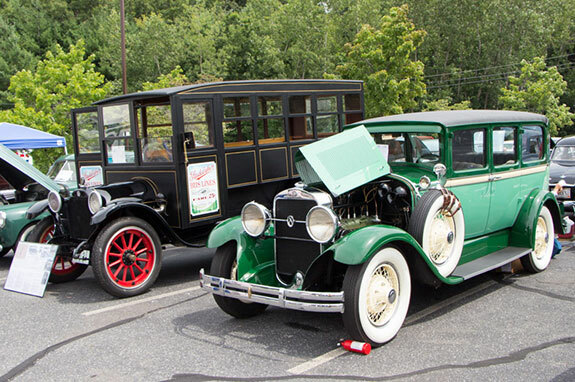 Adding Packard to our lineup of vehicles makes for a much broader spectrum to the show field. I have been working on a new website for the Ocean Bay Club on and off the last couple of months and its finaly up. The current site has been up since the end of 2009 which does not seem like that long ago but the way things change on the internet 4 years is a long time to go without a major update. Things move very fast on the internet and with technology new standards come into use all the time for how sites should be designed, new web browsers and new devices like tablets and smart phones are becoming more and more popular. The new site is simple and clean and it ties into the new newsletter design better. My hope is it might help drive new members to the club by making it show up higher in search engines like Bing and Google. So the basic site with all the standard information like calendar of events, news items and gallery’s will be up at launch but I have a few other additions I am working on that I will talk about at a later date when they are ready. Also if you are a Facebook member you should be sure to visit and “like” the clubs Facebook site which Bob Gray runs so we can keep you up to date on upcoming meetings and club news instantly. The zone meet started out with people from as far away as Canada from the north and New Jersey to our south arriving on Friday night. After check in on Friday night many people had the opportunity to wander the parking lot looking at the cars that were there and the chance to swap stories with other Studebaker owners. That all ended with the arrival of rain later on that evening. Saturday started out rain free but remained overcast with what looked like rain clouds. The rain held off and although it was overcast it was a nice day. The show went well with about seventy cars and trucks and even a bus on hand. We had twenty Avanti’s on the show field, by far our largest class. After the show many members went back to their rooms to relax and get ready for the awards banquet. After a nice dinner at the banquet our MC for the evening George Manoogian got things underway. George told a few jokes, held the 50/50 raffle and gave away some door prizes. Then it was onto the awards, see our list of winners in this issue of the Studegram. Congratulations to Lynn Derosier for winning the 50/50 raffle. Ocean Bay’s June meeting was quite a bit different than many of our regular meetings thanks to the efforts of Janet Thibeault. 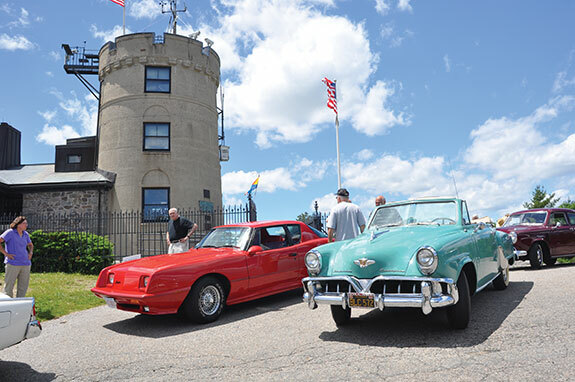 Janet for many years has tried to get permission from the Blue Hills Observatory to allow the Ocean Bay members to drive their Studebakers to the top of Blue Hill and tour the observatory. Well this year she succeeded and on June 9th we all had the opportunity to make the drive to the top. What a thrill it was to drive up the windy road to the top and see the view. It was a beautiful day, the weather was perfect and the sky was crystal clear. Massachusetts - Rhode Island Chapter of the Studebaker Drivers Club, Inc.